certain functions of the control not working at all. 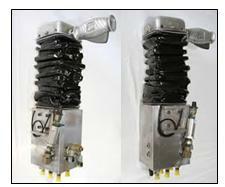 There are a number of ways of fixing a malfunctioning upper control valve. The solution may be as simple as a seal kit to stop the leaking. But it may be something more involved that would require detailed work to replace worn or damaged parts — parts as small as springs and O’rings. Utility Equipment Parts provides a rebuilding service for most upper control valves, including Hi-Ranger single stick assemblies. We can even service older bucket truck models. The price for a rebuild is about $2,500.00 plus shipping. That is about $1,500.00 less than the cost of a new control assembly. All the working parts of the valve would be replaced. The rebuild will take about 8 hours — no more than 2 days. The rebuilt control is shipped back to you. To start the process contact us for more information.